Welcome to a special Write Pink! edition of Bigger Picture Moments! This week, in keeping with the theme of sharing stories, we'd like to encourage you to use your Bigger Picture Moment to Write Pink. Tell us your thoughts about breast cancer awareness with regards to education. Visit Sarah for some prompts to get you started and to link up your own story. And as a thank you for sharing your stories today, your submitted link will become an automatic entry for an awesome giveaway hosted by two of our Write Pink! sponsors. Bamboo Luxury is donating a set of two Soft Bamboo Velour Pillow Cases (The better to rest your pretty head after thinking so deeply about breast cancer awareness and education!) and Army of Women is donating a signed copy of Dr. Susan Love's Breast Book (The better to get even more educated!). Thank you for Writing Pink today, and sharing your story -- no matter how much or little contact you've had with breast cancer, your story could help someone else! I consider myself well educated. I went to a fairly prestigious (in small liberal arts college circles) college. I continue to educate myself through classes and reading. I know a lot about breast cancer prevention. I was a bio/pre med major. I volunteered on a cancer floor for my four years at college. Do monthly self exams, and yearly exams with doctor. Mammograms and early detection are key. Is any of this knowledge useful or powerful if I don’t follow it? If I don’t make active and consistent changes because of it? My (paternal) grandmother died of breast cancer. One of the reasons was the lack of education and support at the time (80’s). She found a lump and she did nothing until it was too late. I know, I am educated yet I don’t consistently do self exams. Am I any better off than her? I have frequently written about breast cancer and have helped spread the word, educating others. How can I be so hypocritical to not do it myself? I have excuses, lots of them. I think the truth is I am scared. I have family history, I have fibrocystic breasts, I have had two ultrasounds for scares. It’s easier to be inconsistent in my care then to take the time to really get to know my own breasts so I can spot the changes. 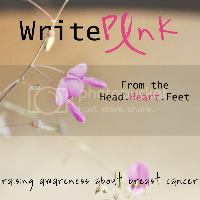 Write Pink! Has really opened up my eyes to how much better I have to be. I can no longer talk the talk, without walking the walk. There are little breasts in my house. Little breasts that will inherit the risk not only form my grandmother, but from her own (my mother in law). She will learn from me and I want her to learn to not just have the knowledge but to use it to make smart and healthy choices. My grandmother may have not know who to talk to or what to do but I do. I need to make myself and my breasts a priority, at least for 5 minutes a month. It is scary to do a self exam, and I put it off, too, when I know I shouldn't. Doing it for our daughters is the best reason of all! Thanks for helping to spread awareness! I ignore for the same reasons as you- family history, fibercystic breasts, though only one scare with ultrasound. I need to check. I know.